In February, the NM State Library sponsored several events around Santa Fe to tie in with Shakespeare’s First Folio exhibit at the New Mexico Museum of Art. 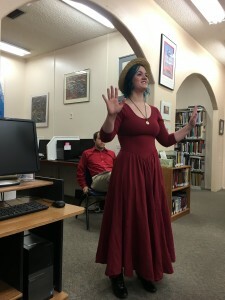 In colloboration with Santa Fe Performing Arts, 2 actors visited 3 libraries performing sort scenes from a variety of Shakespeare’s works. They visited Irene S. Sweetkind Public Library in Cochiti Lake, Vista Grande Public Library and Espanola Public Library. The scenes were short, 2-3 minutes segments are ranged from Romeo and Juliet to A Midsummer Night’s Dream. 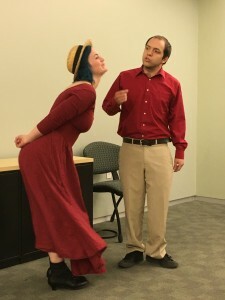 Our 2 actors, Joey and Hamilton are Santa Fe residents and are not strangers to the world of Shakespeare on the stage! 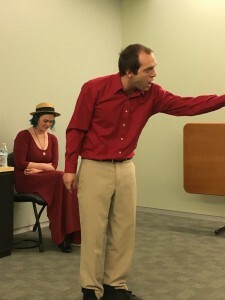 Thank you to everyone who came out as well as the libraries and our wonderful actors! Congratulations to the Youth Services staff of the Ruidoso Public Library!